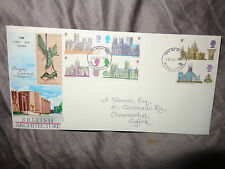 Great Britian 1966 FDC. Battle of Hastings Issues. London EC postmark. Cover in very good condition. Exactly as per scan _______________________________________. FDC QEII UN 25/10/65 London h/s ordinary. First Day Cover - Battle of Hastings 900th Anniversary - Quadruple Stamped - 14/10/66 London - Tear to back of envelope and 2" split to edge, but acceptable condition as a filler for a collection - Hence low starting price - Envelope size 11" x 5"
First Day Cover - Battle of Hastings 900th Anniversary - Stamped - Recorded Delivery - 14/10/66 Southampton - Good condition - Envelope sealed. Postally used cover with imperfections as scanned; envelope has been opened to flap, and has some postage wear; no contents; see scan which forms a part of this description. All postcards and ephemera will be sent in card backed envelopes, marked do not bend, for protection. This leads to somewhat higher postage costs, but ensures you receive the card as advertised, hence the slightly higher postage cost. Please see my other items. Photo is a scan of the actual item you will receive. Collection is NOT available unless specified. Sealed. Has a card inside. Good condition. We offer postage discounts for multiple purchases subject to Royal Mail’s weight and size scheme. For combined postage you must sign/log on to ebay.co.uk. This allows you to place the items in the basket and then use the “Request Total from Seller” (do not use the Proceed to Checkout button). We will then weigh your items and send you an invoice. Discounts cannot be given if you pay for your items individually or before we have sent a combined invoice. 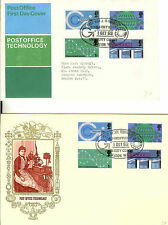 If you have any problems, please contact us..
Tercentenary Of Establishment of General Letter Office 1960 First Day Cover. Dispatched with Royal Mail 1st Class Letter. The item has been stored in a collectors folder for the past 40 years, and is in excellent condition. DECLARATION OF ARBROATH 650TH ANNIVERSARY 1970. GB FDC Supersonic Concorde - 3rd March 1969. Dispatched with Royal Mail 2nd Class Large Letter. Historical events of the theatre 1982. 1969 GB Stamps First Day Cover - Investiture of the Prince of Wales. Issue date: 1 July - Stamp Reference: SG802. Bicentenary of the Derby". References: SG1087-1090. This item is being sold for our charitable cause, to help a three year old little girl with cerebral palsy to obtain much needed physiotherapy currently not available on the NHS. From my late fathers own personal collection and in excellent condition. 9/9/1961-GB FDC-50th Anniversary of First Aerial Post - Windsor & BEA Handstamp. Captain Cook's Voyage -Bi-centenary - FDC 29.05.68 -- Posted. In clean and strong condition.